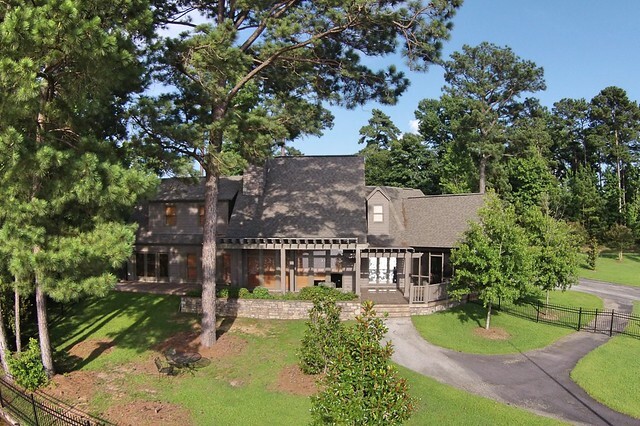 1409 Trillium W Parkway in Lake Martin is all about sunsets and flip flops! The sunset view is big here! The large lot is extremely flat with over 370 feet of waterfront footage. It is beautifully landscaped and also fenced making it a dog lover’s dream. Inside the house are 4 bedrooms and 4 1/2 bathrooms on two levels. It has soaring ceilings in the great room, beautiful trim throughout, a wood burning fireplace, an island and a bar area in the kitchen, and tile floors in the living areas. Upstairs is space that would be perfect for bunk beds or a media room. Located in the Trillium neighborhood this Russell Lands waterfront development is on the south side of the lake near Kowaliga. Because it is such a walkable neighborhood it is rare that you don’t see the neighbors riding bikes or walking because of the flat topography. Are you ready to own a lake house that your dog really digs? Keep those flip flops on and come see 1409 Trillium W Parkway!